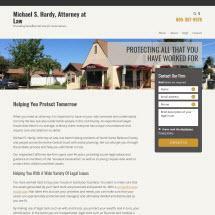 Michael S. Hardy, Attorney at Law combines sophisticated legal advocacy with the personalized attention that you would find at a small-town law firm. For more than 40 years, we have established long-term relationships with California residents and businesses by understanding and responding to their legal needs. Proactive steps must be taken when considering wealth planning and estate planning. You may not want to consider your own mortality. However, wills and trusts can provide you and your loved ones peace of mind. Health care directives, financial powers of attorney or conservatorships give you control and a much-needed voice when you are impaired or unable to communicate your wishes. We help draft all documents and represent you in probate-related and trust administration matters. Santa Maria lawyer Michael Hardy and the staff at our law office take pride in the quality of legal work and remain committed to protecting the best interests of our clients. We invest all resources in pursuing the best outcome by being hands-on in finding resolutions. Our high level of commitment goes beyond the walls of Michael S. Hardy, Attorney at Law and into the local community where we all live and work.